3010, Hubcap used, 14", CHEVY, PASSENGER, IMPALA, WIRE TYPE. 3078, HUBCAP USED, 13", 76-80, CHEVY, MONZA, VEGA, CHROME RING, MACHINED, 14 SLOT TYPE, BLACK CENTER & CHROME STICKER BOWTIE, METAL CLIPS. 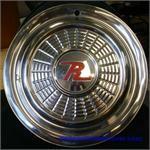 3078, HUBCAP USED, 13", 76-80, CHEVY, MONZA, VEGA, CHROME RING, MACHINED, 14 SLOT TYPE. WITH BLACK CENTER & CHROME STICKER BOWTIE, METAL CLIPS. 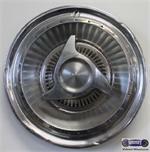 4023, Hubcap used, 15", 71, OLDSMOBILE, CHROME RING, MACHINED CENTER, BLACK BETWEEN RIBS, ENGRAVED PAINTED BLACK EMBLEM. METAL CLIPS. 4023, Hubcap used, 15", 71, OLDSMOBILE, CHROME RING, MACHINED CENTER, BLACK BETWEEN RIBS & ENGRAVED PAINTED BLACK EMBLEM. METAL CLIPS. 64002, Hubcap used, 13", 69, TRIUMPH, GT6, 5 SPOKE TYPE, POLISHED OUTER RING AND SPOKES, 5 BLACK PAINTED POCKETS, 5 FAKE LUG NUT CAPS, SMALL DOME SHAPED CENTER POLISHED, SNAP ON RING. 898, CENTER CAP, USED, 73, FORD, PINTO, CHROME METAL CAP, 4 CUTOUTS FOR LUG NUTS, 4 SCREW HOLES, BLACK CENTER, CHROME LOGO, 4-5/16" DIA., 2-5/8" TALL. BUICK-3, HUBCAP CENTER, VINTAGE, METAL WITH BUICK SHIELD, [FADED RED WHITE & BLUE] METAL CLIPS & 4 PINS TO HOLD INTO HUBCAP, OUTSIDE 2-7/8" X 2/1/4" ON CLIPS. O-11, Hubcap used, 14", 1964, FORD GALAXIE 500 XL, POLISHED OUTER RING, 49 POCKETS SILVER PAINTED, 3 FIN RAISED CENTER, RED WHITE AND BLUE BACKGROUND, CHROME OUTLINED BLACK XL, METAL PUNCHED CLIPS. X-12, HUBCAP USED, 14", 66, PLYMOUTH, PASSENGER, BELVEDERE, SATELLITE, CHROME OUTER RING, BLACK PAINTED RIBS, RAISED CENTER PAINTED BLACK WITH 3 BAR SPINNER, RED CENTER & CHROME RED & BLUE LOGO, METAL CLIPS. Z-1, Hubcap used, 15", 59-60, RAMBLER, REBEL, RED R IN CENTER, METAL CLIPS. Z-10/281, Hubcap used, 15", 63-65, RAMBLER, BLACK PAINTED POCKETS, RED R, METAL CLIPS, 12 RIB TYPE, ORDER UNDER 281 HUBCAP. Price: ORDER UNDER 281 HUBCAP. Z-11, Hubcap used, 14", 64, RAMBLER, AMERICAN, BLACK PAINTED RING IN CENTER, RED R, METAL CLIPS.